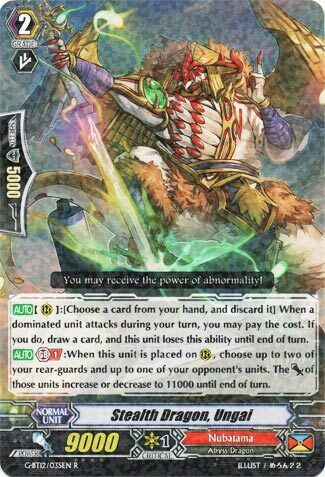 [AUTO](RC):[Choose a card from your hand, and discard it] When a dominated unit attacks during your turn, you may pay the cost. If you do, draw a card, and this unit loses this ability until end of turn. [AUTO] Generation Break 1:When this unit is placed on (RC), choose up to two of your rear-guards and up to one of your opponent’s units. The [Power] of those units increase or decrease to 11000 until end of turn. Oh dude, can you imagine this against a deck that makes the opponent call during their turn? Look at that G-Unit shrink. SHRINK I SAY! I digress. This isn’t anything to run in favour of better stuff. Metsu and Genkai are actual +1s with better skills.